After using Windows 8 for a while, I’ve come to the conclusion that removing the Start button from the Taskbar was a huge mistake. Here’s how to make your own “Start” button that brings up the Metro Start screen—but doesn’t waste any memory at all. What we’ll be doing is pretty simple—create a script that simulates pressing the Windows key button, make it into an executable, assign an icon, and pin it to the taskbar so that it sorta looks like the Start button, and works the same way. Since nothing is running, no RAM is wasted. Save the script, and then right-click and choose the Compile Script option, which will create an executable file. 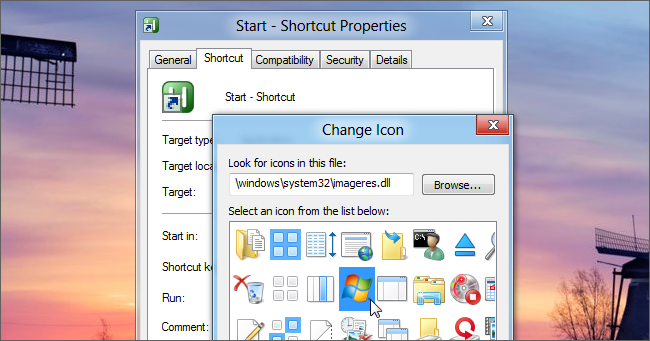 Right-click on the .exe and choose Create Shortcut, and then open up the Shortcut properties screen. In here you’ll want to browse for the imageres.dll file, which has a lot of pretty icons in it. Here’s the path, which obviously will need to be adjusted if you installed Windows somewhere else. There’s a Windows flag icon in there, as well as some other icons… and of course, you could use any icon file here if you wanted, including one that you’ve downloaded from somewhere. Now you’ll want to use the Pin to Taskbar option on the context menu–you’ll probably need to drag it into the right position. You’ll notice that I choose the Metro-style Window icon, which actually looks pretty cool… but again, you can use any icon you want. That’s all there is to it—press the button, the Metro Start screen will come up. Zero memory usage, since nothing is running in the background. In fact, you should be able to uninstall AutoHotkey at this point if you want.